It’s been quite some time since I mentioned (or touched!) my 2014 UFO To Do List! These are projects that have been in progress or that I’ve been meaning to start. Most of them have been on my list for multiple years. Eek! My Mustachio blocks are finally a quilt, with fmq & binding complete at last! This fun quilt now lives at the top of my stairs! 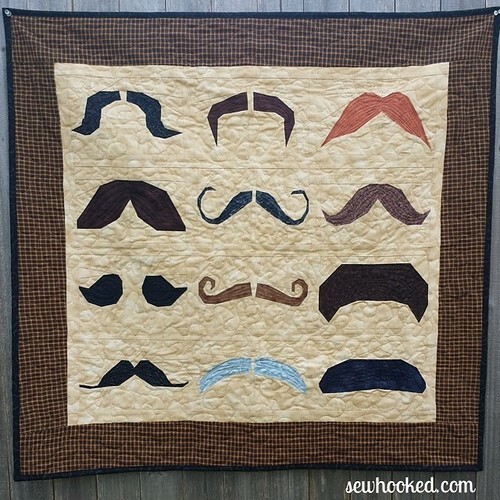 Get the Mustachio block pattern set on Craftsy! NAWWAL – putting this on hold. May pick up again in 2015. Share your Paper Piecing Vintage photos with the Sewhooked flickr group for a chance to win fun prizes all year long. The June prize is a free PDF copy of my original pattern, Poppies from the Past! Winner to be announced the first week of July. Featured Pattern: Topsy-Turvy Trees, just $7 on Craftsy! This entry was posted in -sewhooked website- and tagged 2014 to do, finish, finish it in 2014, mustache, mustache quilt pattern, mustachio, ufo on June 20, 2014 by Jennifer Ofenstein. Wow, your’re doing fantastic on your to do list!! !